There is something so deliciously special about cheesecake, am I right? It is difficult to describe a really good bite of cheesecake in words, but I’d start with creamy, dreamy and smooth. I learned after perfecting this cake in the Instant Pot that baked goods turn out indescribably scrumptious.. Yesterday was my 8-year-old's favorite food day of the year...Cheese Lover's Day! This boy loves his cheese, like SERIOUSLY loves it. He discovered this very wonderful day last year and did not let me forget about celebrating again this year. Last year he requested Banana Cheesecake and this year a Butterfinger variety! This is my last bit of "business" to wrap up before we head out for our yearly family waterpark vacation. We all look forward to this trip and it always seems to fly by. I intend to savor every moment with my boys! Just like I savored every bite of this cheesecake! I haven't been thinking about food too much this week, but I did manage to pull these tasty little treats together (inspired by Epicurean Mom). I loved them. They were summery and fresh, which are two of my favorite words to describe food lately with all of this warm (and wonderful) weather. 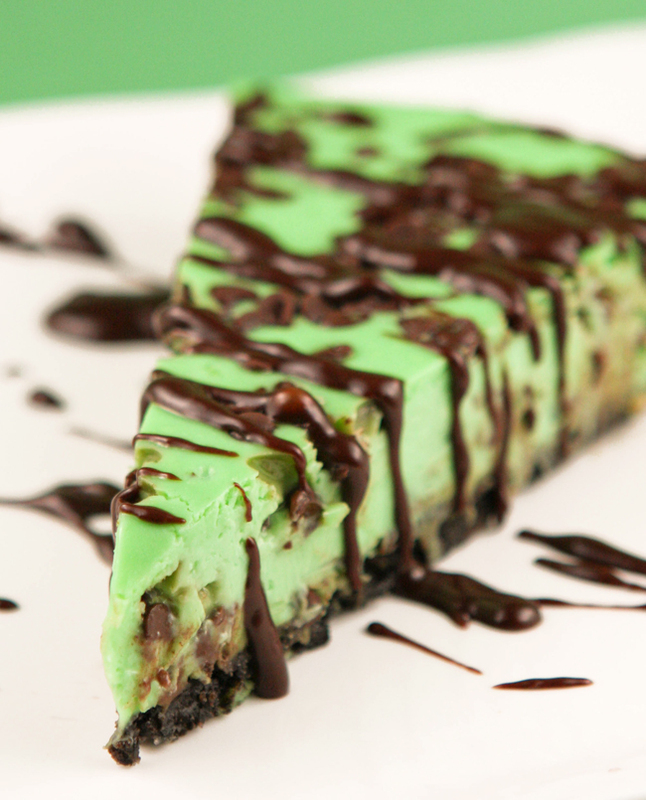 This cheesecake is so festive and deliciously minty! Plus, what isn't delicious when it's drizzled with chocolate! I haven't been outside yet today, but the weather looks incredible again. I will be making my way out soon to enjoy it. In the meantime, here I sit in my pajamas eating green cheesecake. At 10:00 in the morning. Don't judge! Pulse until fine crumbs form. Add 5 tablespoons of melted butter and pulse a few more times, just until the crumbs become moistened. Press the cookie crumbs into the bottom of a 9-inch springform pan. Set aside. Place three 8-ounce packages of softened cream cheese into a large bowl. Using a hand-held mixer, beat on medium speed for about 3 minutes, or until the cream cheese is light and fluffy. Add a 14-ounce can of sweetened condensed milk and mix until fully incorporated. Add 3 eggs and mix until incorporated. Using a spoon, stir the chocolate chips into to the cream cheese mixture. Pour the mixture into the prepared springform pan. Top with 1/2 cup miniature chocolate chips. To avoid cracking, immediately run a knife along the edge of the cheesecake to separate it from the pan. Do not remove the side of the pan, however, until it has completely cooled. Let the cheesecake cool at room temperature and then refrigerate it until it is ready to serve. Heat in the microwave for 30 seconds and stir until creamy. Heat in additional 15-second intervals, if needed, stirring after each interval, until creamy. Drizzle the melted chocolate over each slice before serving. Preheat oven to 300 degrees F. In a food processor, combine the Oreo and Grasshopper cookies. Pulse until fine crumbs form. Add the butter and pulse a few times, just until crumbs become moistened. Press the cookie crumbs into the bottom of a 9-inch springform pan. Set aside. In a large bowl, using a hand-held mixer, beat the cream cheese on medium speed until light and fluffy, about 3 minutes. Add the sweetened condensed milk and mix until just incorporated. Add the eggs and mix until incorporated. 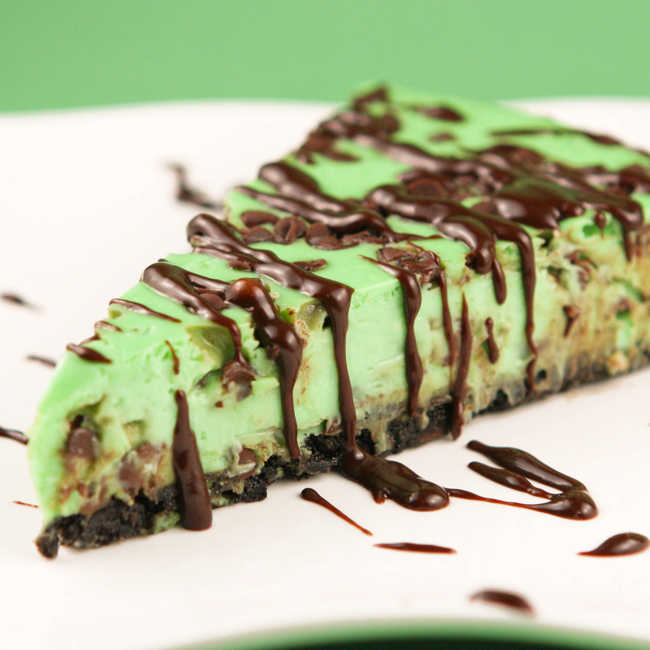 Add the Crème de Menthe, peppermint extract and food coloring and mix well. In a small bowl, combine 1 cup of the chocolate chips with the flour. Stir to coat. Add the flour-coated chocolate chips to the cream cheese mixture and stir. Pour the mixture into the prepared springform pan. Top with ½ cup of chocolate chips. Place the pan on a baking sheet and bake in the preheated oven for one hour. Remove pan from oven and immediately use a knife to separate the cheesecake from the edge of the pan all the way around. Let cool. Refrigerate until ready to serve. Just before serving, in a small bowl, combine ½ cup of the chocolate chips with the milk and microwave on high for 30 seconds. Stir until smooth. Microwave in 15-second intervals, if needed, stirring after each interval, until smooth. Drizzle the melted chocolate over each slice of cheesecake, and serve. A few weeks ago we celebrated a friend's life, which sadly ended far too soon. Our celebration of his time on earth was bittersweet. It was great fun, but we missed our friend. The celebration involved food and martinis. Food because, well, everyone needs food, and martinis because our friend loved martinis.